A Happy Birthday Heavy Metal Box for my son. Today we took my son Josh and his girlfriend, April, out to eat for his 37th birthday (which was actually last weekend). I always give him money - as that's what he likes most - so he can use it as he wishes - but I always put it in a homemade card. This year I was inspired by the A Vintage Journey Heavy Metal Challenge for my design of Josh's gift container. I made a box to hold the monetary gift. 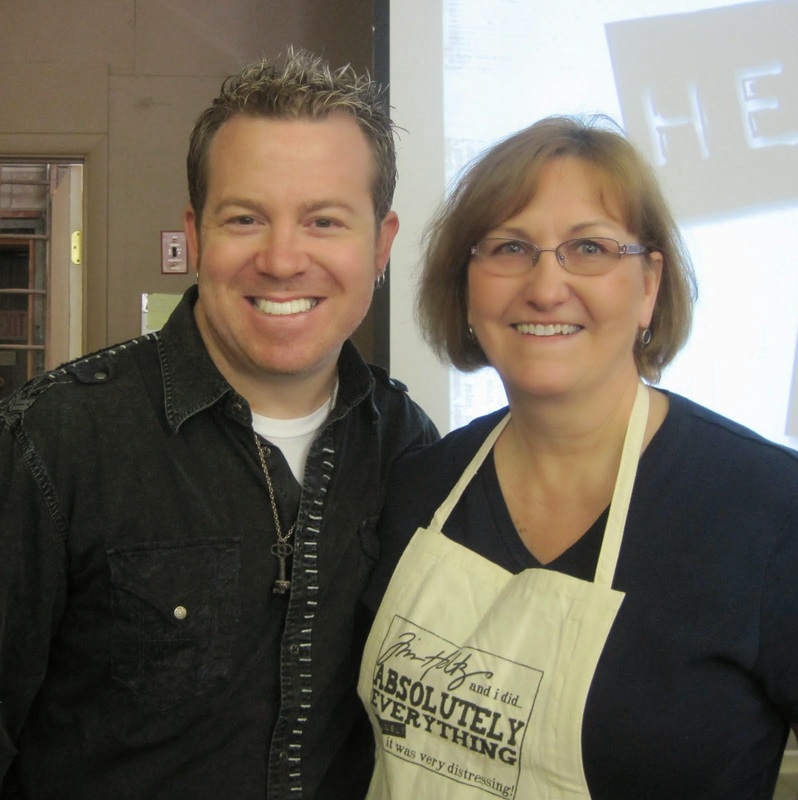 For the challenge you can use any form of metal - paper, paint, Idea-ology pieces and it has to be in the "Tim Holtz" style. Here are some photos of the steps I took to create this box. Using Little Sizzles Black Mat Board - I die cut two pieces for the box using the Sizzix Block/Cube/Bank 3D die. Then I masked each piece with Eclipse tape. I then stenciled the sides with Tim's Dot Fade, Stripes and Lattice Work Stencils using Brushed Pewter Distress Paint - the paint, being more liquid than ink, ran a bit behind the stencils but I like the look it gives! Then I went to work adding stampings and metal to the sides. Here's how the decorated panels look before putting the two pieces of the box together. Here is a close up of the top of the box. My son was in the Army for about 8 years right out of High School. He had hoped to make the military his career - but he was shot (by a civilian in a robbery) while he was stationed at Ft. Bragg, NC - and had to be discharged on disability. He was left blind in one eye, with a bullet lodged in his neck near his spine, suffering from nerve headaches and a good dose of PTS, but otherwise in good pretty good shape considering - and thankful to be alive. This all happened over 14 years ago. He now works in a motorcycle shop and riding is his passion - so heavy metal is a good theme for him! I chose the LUCKY Heart Charm for the top of his box - as he was blessed to have survived when he was shot - he also has a tattoo of the word on his arm and it's his biker name amongst his friends. I painted the Clock Key and Time Piece with the Brushed Pewter Distress Paint and used a wire pin to attach the Heart Charm. On the front panel I adhered Mirrored Stars along with a sentiment and frame from Saying Stuff from Stampers Anonymous which I Black Sparkle embossed on Brushed Silver card stock. I painted a Word Band with the same Distress Paint, wove a piece of Tinsel Twine through it and adhered it to the box with Glue N Seal. I embossed this sentiment (Keep Cool and Bike On) from Jillian Vance Designs on silver, punched it out and adhered it with a foam dot. More Tinsel Twine knotted through a Philosophy Tag painted with the Distress Pewter. 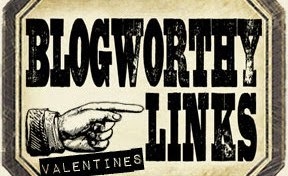 This sentiment is from Classics #16 Stampers Anonymous. Again - embossed with Black Sparkle on silver card stock - I hand cut around the sentiment and adhered it with foam dots. Another sentiment from Live to Ride set by Jillian Vance Designs - and two Sprocket Gears painted with the Distress Paint. I'm happy to say he liked his Birthday Gift Box (along with a check and 4 Reeses Peanut Butter cups inside)! You'll find the A Vintage Journey challenge here. 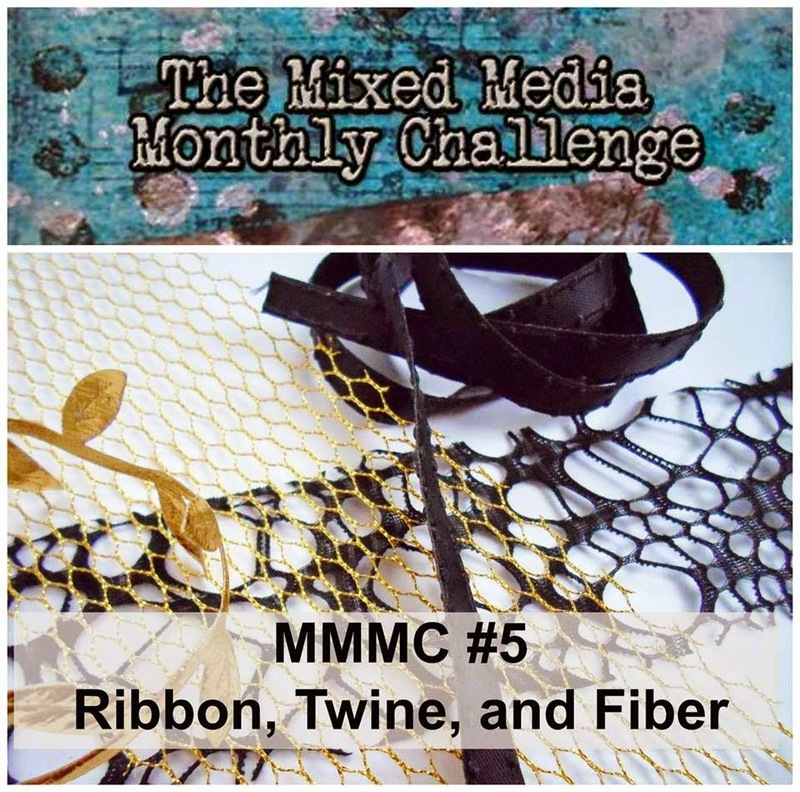 I'm also linking this to the Mixed Media Monthly Challenge #5 - Ribbon, Twine and Fiber - I used Fiber! Accessories: Black Sparkle Embossing Powder - Ranger, Ranger Distress Paint - Brushed Pewter, foam dots, Glue N Seal - Ranger, ScorTape, Idea-ology Time Pieces, Clock Keys, Word Bands, Tinsel Twine, Sprocket Gears, Philosohy Tags, Wire Pins, Heart Charms, Mirrored Stars, Die - Block/Cube/Bank 3D - Sizzix, Tim Holtz Stencils - Stripes, Latticwork, Dot Fade. I've got Halloween on my mind - after purchasing Tim Holtz new Halftone Halloween stamp set! 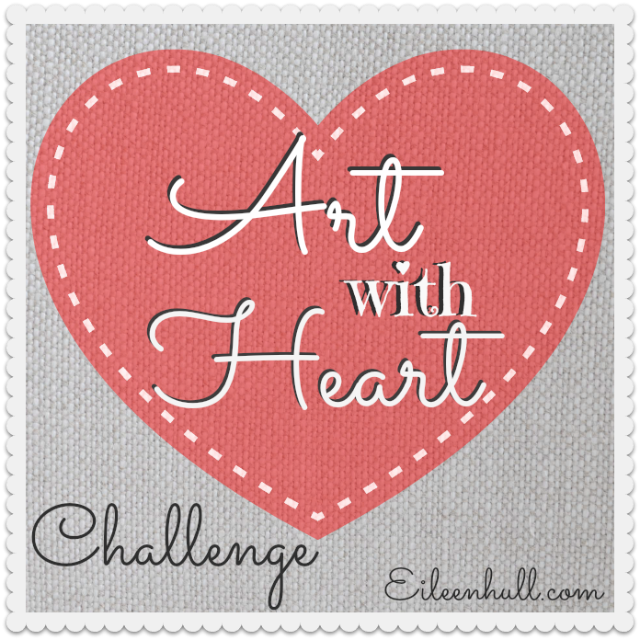 And I wanted to play along with Eileen Hull's August Art With Heart challenge - Anything Goes. Since Eileen is the very talented designer of the wonderful Cube Boxes from Sizzix - I decided to combine my new stamps and her Block/Cube/Bank Die for my project. This box is a 3" cube. 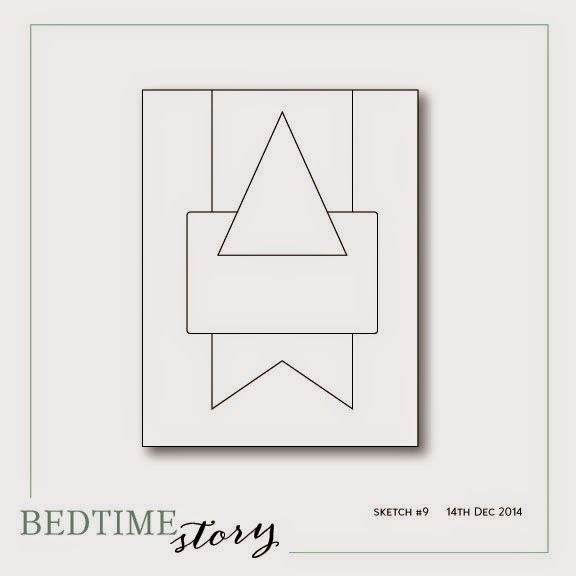 I cut it out of Little Sizzles Black Mat Board from Sizzix. There are two stamps for each image with Tim's Half Tone stamp sets . There's a background stamp made up of small dots and an outline stamp. For example the dots piece is in blue on the skull and the outline is in black. For the cats, the dots are the eyes. 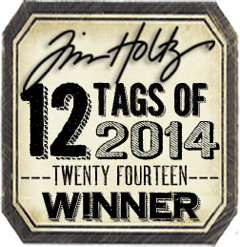 I stamped them all on Tim Holtz Specialty Paper and hand cut them out. For each panel I cut a piece of Coredinations Kraft Core Paper and sanded each piece so the kraft core showed through. Then I stamped each panel with various Tim Holtz stamps to complement the Halloween image. I used stamps from The Chemist, Classics #16 and Bird Feathers. For the top piece on my box, I stamped the witch and moon from the Halftone Halloween set on a panel I die cut with Tim's Arch Frame. It is wider than the box So I cut away below the image, folded the small end and slipped it through a slice I made in the Kraft Core panel I was attaching to the top of the box. And here it is - all done and standing up sweet as you please! Here are each of the completed sides. I used some Remnant Rubs/Apothecary that have a sheet of black rubs and a sheet of white rubs - the skull and text worked perfectly on the back of my arch - where I layered a black arch cut to fit. I also added the fun Idea-ology Wish Bone that I've been dieing to use on something! I stamped the Halloween images with Archival Inks - Jet Black, Dandelion, Orange Blossom, Carnation Red and Cornflower Blue. I added an Idea-ology Corked Vial to the front - having dripped some Rusty Hinge Distress Reinker inside it. I tied black TH Jute String around the neck and added the perfect Apothecary Remnant Rub to the side! I adhered the bottle to the arch with ScorTape and added a glue dot to the bottom to hold it to the cover. I sponged the edge of the arch with Vintage Photo Distress Ink. More remnant rubs on the cover and a Ring Fastener attached to hold the Swivel Clasp. I died a piece of Crinkle Ribbon by dragging it through Rusty Hinge and Stormy Sky Distress Reinkers spritzed with water, then crinkled and dried with a heat tool. The swivel clasp makes it quite easy to open the box so the receiver can take a peek at whatever creepy things are tucked inside! I tucked a piece of Trimmings/Natural Black Cream behind the skeleton. 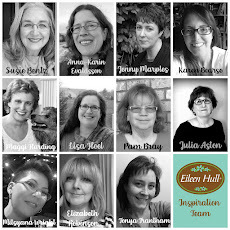 I really love working with Eileen's fun boxes. She has just come out with a new line of boxes called Vintage Kitchen - and we can win one by participating in her Art with Heart challenge this month! I also posted it on my blog a while ago here. I'm playing along with the Compendium of Curiosities Vol 3 challenges. 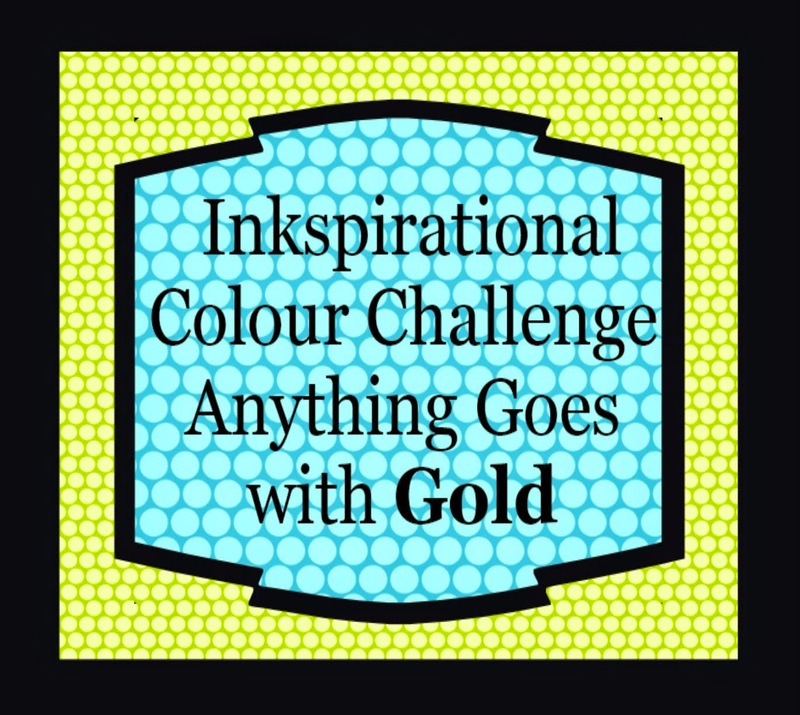 Challenge #4 is to use the Layering Stencil Texture Paste technique that Tim teaches us on Page 49 of CC Vol 3. We cannot describe the technique - as they want you to purchase your own copy of Tim's book - but here is my project using the technique - and I can describe how I put it together! I made an ATB (Artist Trading Box) using Eileen Hull's Blocks/Cube die from Sizzix. There are 3 sizes on the die. This is the largest one measuring 2 1/2" square. 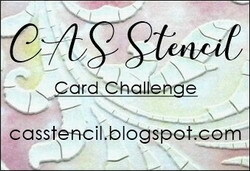 I was going to be making tags for all of these challenges - but I'm really having fun with these wonderful ATB's so decided to use this technique on a block! I used the Layering Stencil Texture Paste technique on the panels that I adhered to each side of the box. Here is the panel before I cut it since you can't see it too well with all the findings I decorated my box with! I adhered the cut stenciled panels to all of the sides and then started adding my findings. You want to be sure you have placed things the right way up when you go to put your cube together! All of the 4th of July images on the panels are cut from Tim Holtz Paper Stash 8X8" Seasonal. I sponged the edges and curled the corners of the images before layering them on the panels. I added a Chit Chat Sticker to each as well as a Mini Gear that I inked with Carnation Red Archival ink. and the other side - I put a piece of Film Strip Ribbon with the Chit Chat Sticker on this side. and the top! I added some Remnent Rubs Botanical and Life Quotes here. I screwed a Clock Key in the center of the top of the box, died some Crinkle Ribbon with Worn Lipstick and Salty Ocean Distress Stain and water, dried it and looped it through the holes on the key. I added a Mini Numeral 4 to the Clock Key with a thick glue dot as well as the Paper Rosette that I cut out of Ranger Distress Core-dinations paper. Here you can see how I just hung the tails of the ribbon over the side of the box. 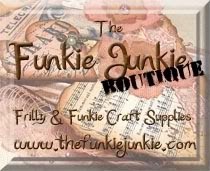 CC3C is sponsored by the Funkie Junkie Boutique this time and a $25 gift certificate will be awarded to one lucky randomly chosen winner! There's also a prize package from Tim and Mario awarded! 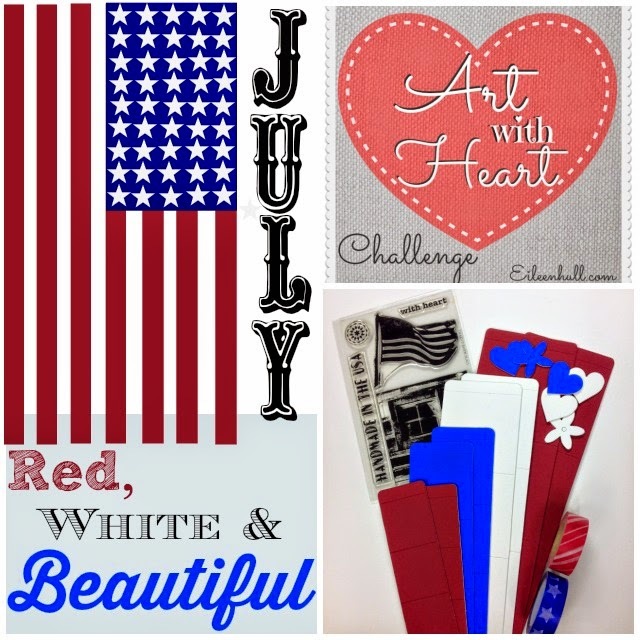 I'm also linking my 4th of July box to Eileen Hull's Art with Heart June Challenge - Summer Celebrations. Thanks so much for stopping by - I really appreciate any comments that you leave for me! Paper: Little Sizzles white Matboard - Sizzix, Ranger Distress Core-dinations, Paper Stash 8x8" Seasonal. Ink: Ranger Distress Brushed Corduroy, Archival Carnation Red. Accessories: Idea-ology - Clock Keys, Chit Chat Stickers, Film Strip Ribbon, Mini Gears, Remnent Rubs Botanicals and Life Quotes, Mini Numerals, Crinkle Ribbon; thick glue dot, Glue N Seal, ScorTape, Water Mister, White Embossing Paste - Studio 490 Wendy Vecchi, Stencils: Stargaze- My Favorite Things, Cargo and Dot Fade Tim Holtz, Paper Rosette die Alterations, Blocks/Cube Die - Sizzix Eileen Hull.